So I got the jumbo Pocket Atlas in today and I was comparing between it and SkySafari. I was browsing around and noticed an inconsistency in star names. In particular, on chart 15 in the jumbo Pocket Atlas at the top there is the three star chain (in Perseus) right below the California Nebula. In the Pocket Atlas the corner double star is marked as “Atik” and the double star to the right at the end of the line is marked as “Omicron”. 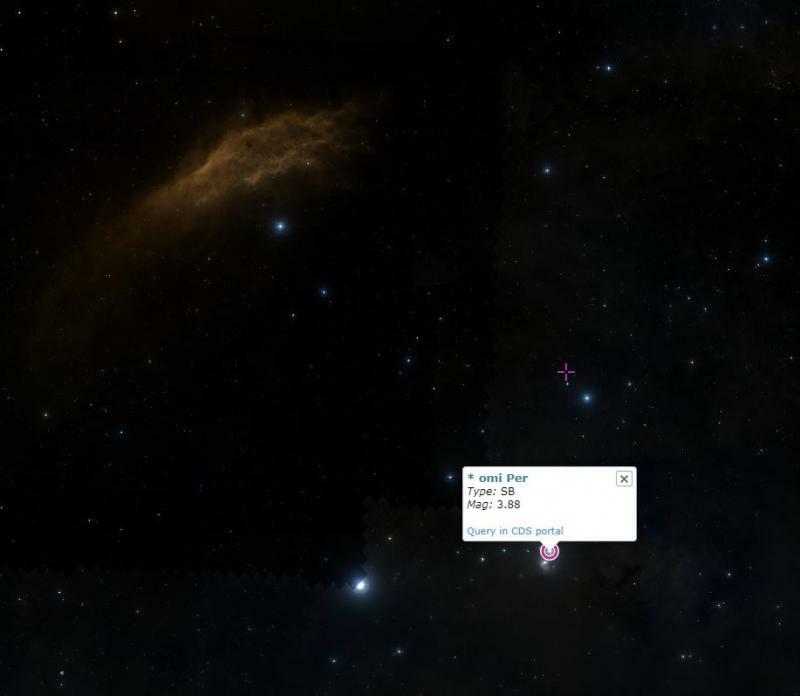 But, if you open SkySafari, “Zeta Persei” is listed as the corner star (not Atik) while the star to the right is listed as “Atik” (not Omicron). That’s opposite from and different from the Pocket Atlas. So what gives here? Why the differences? Edited by Biggen, 18 January 2019 - 07:12 PM. Moving this to Astronomy Software & Computers, for better fit of topic. Stellarium is a free download. PSA is wrong about the proper name, but has the greek letter designation correct. Atik is the star on the end of the chain and has the open cluster with nebula IC 348 to the south. Nice catch! It bore the traditional name Atik (also Ati, Al Atik), Arabic for "the shoulder". 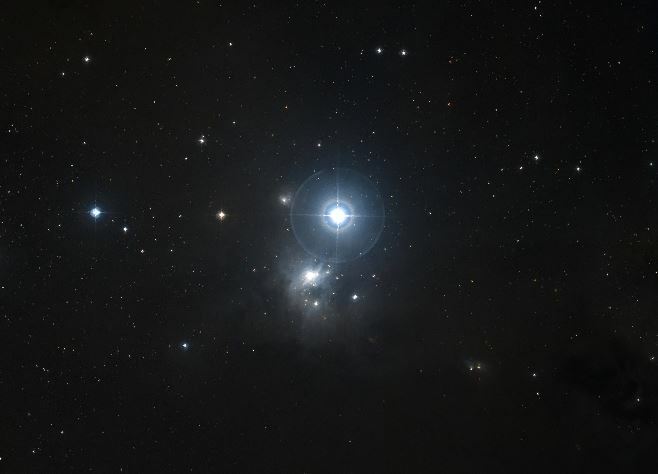 Some sources, including a planetarium software package, an atlas, and a web site attribute the name Atik to the nearby, brighter star Zeta Persei. In 2016, the International Astronomical Union organized a Working Group on Star Names (WGSN) to catalogue and standardize proper names for stars. The WGSN decided to attribute proper names to individual stars rather than entire multiple systems. It approved the name Atik for the component Omicron Persei A on 12 September 2016 and it is now so included in the List of IAU-approved Star Names. The Wikipedia article references the Cambridge Double Star Atlas  which was published in 2009. This is after PSA was published in 2006, so Zeta was given the name Atik for some other reason in the PSA. Edited by brentknight, 19 January 2019 - 01:22 AM. Doing a little more digging, I've learned that the original Arabic depictions of Perseus likely had the figure reversed. 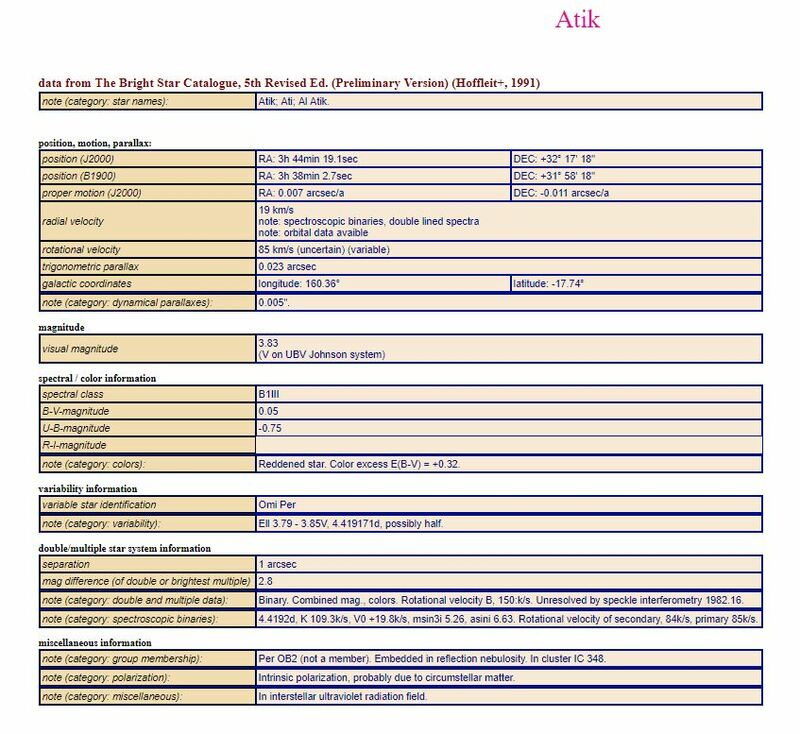 Atik - "The Shoulder" is now the left foot. According to Star Names - Their Lore and Meaning (R. H. Allen, p.334), this is how Perseus is shown on a globe dating back to the 13th century. I looked at my copy of Sky Atlas 2000, which is also by Roger Sinnott, and Zeta Persei is also labeled as Atik. Star Names states that Omicron Persei is Atik and is marked on that Arabic globe by the astronomer Ulug Beg. However, I have another book called The Constellations (Nathanson, p.338) that seems pretty certain that Zeta is Atik. Edited by brentknight, 19 January 2019 - 03:30 AM. Brent thats an excellent explanation. I think I'll email the author of PSA. I'm curious to see what his thoughts are as well. Yeah - it's an interesting problem. Every atlas I've been able to check including Sky Atlas 2000, interstellarum, Red Shift and the PSA have Zeta labeled that way. Uranometria 2000 does not list proper names on the 1st edition, but does on the 2nd edition where it also names Zeta as Atik. 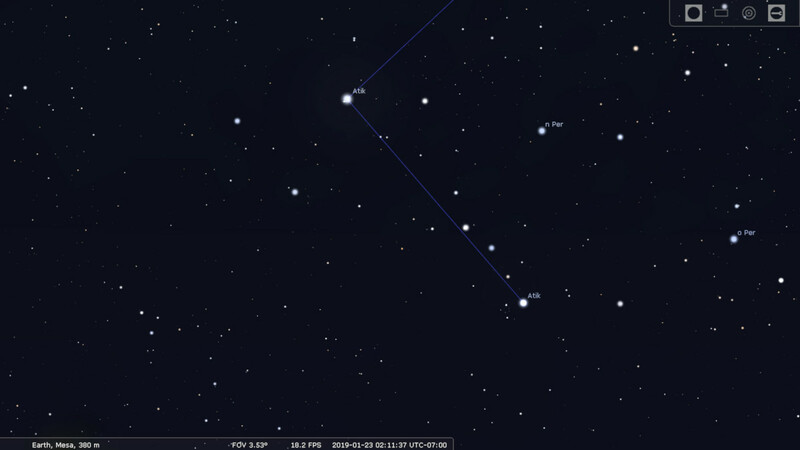 Stellarium lists both Zeta and Omicron as Atik. I could not find what these use as their source of proper names, but they all seem to use the same one and the error persists. I think this is a case of different databases naming things slightly differently. I can easily find cases where either Zeta Per or Omicron Per is called "Atik". Not sure who is correct but the database we use calls Omicron "Atik". For what it's worth, Jim Kahler, noted star expert, follows SkySafari's naming of Omicron as "Atik". Edited by btschumy, 19 January 2019 - 12:51 PM. This is the big reason why I wish telescope mounts would let us use Bayer Greek letters rather than traditional names for stars. A lot of those traditional names differ from one atlas to another, and until recently there was no official authority. (The IAU has now officially adopted a few dozen star names.) Once you start looking for discrepancies between star atlases and catalogues, you'll find plenty! The Greek letters, on the other hand, go back to just 3 authorities (Bayer, Lacaille, and Gould) and are seldom disputed. How many others? I have penciled in the change to Omicron Persei in my copies of these. This is the big reason why I wish telescope mounts would let us use Bayer Greek letters rather than traditional names for stars. A better term might be "obscure names" rather than "traditional" ones. As you say there was never a body of standard astronomical designations until the 20th Century, although certain major atlases (Ptolemy's, Bayer's, etc.) have been standards in effect. The names of many stars have varied. The lower part of Eridanus was redefined and renamed once Northern Europeans started visiting the Southern Hemisphere for example. It is pointless, beyond a certain point, to try to nail down the "real" name of star. It has made sense to use genuinely traditional names that have been used as actual common designations and appear in the scientific literature. But if the name is not a commonly understood designator, in what sense is it actually its name? The literature has gotten filled with star names no one in Europe has heard of in generations (if ever) in the latter half of the 20th Century as scholars knowledgeable in Arabic, or else scouring old European archives, dug up names and began publishing lists of them. This has even led to some purely spurious (I suspect jokes) being adopted as star names, the star "Sarin" for example is (I am pretty sure) a post-war joke by a Czech grad student. But it got printed in an atlas and so become the "name of a star". We don't assign ancient Chinese names to stars. Why do it to Medieval Latin and Arabic? In this particular case it seems that the name "Atik" was attached to two different stars. Which one is the real Atik? There is no real Atik, or they both are. And so the name has no value as an identifier. Edited by careysub, 20 January 2019 - 11:23 PM. Indeed! I am a linguist and am very good at Medieval Latin (though not Arabic). People ask me how to pronounce star names. Well, apart from the fact that there are 4 systems for pronouncing Latin, the problem is some star names have no correct pronunciation because they've been through one distortion after another, through the centuries. Only a few, such as Spica and Sirius, are really good Latin. None, as far as I can tell, are good Arabic, although some are close (Aldebaran, for example). I wonder if any linguist has published a good study of European star names. Much of the classic literature is very credulous and unreliable. I have Kunitzsch and Smart, which I think is reliable. Betelgeuse is pretty good too, I think. Not the way people normally pronounce it, but a reasonably good pronunciation can be read from it (and there are many systems of Arabic transliteration as well). Edited by careysub, 20 January 2019 - 11:47 PM. Alpha, ok. That one is good. But Beta? Nope. In Greek, the letter shaped like the English "B" is pronounced like a "V", so Veeta, like the cheese. The letter shaped like a V is pronounced like an N, and the N (Eta) is pronounced like an E (Eeeta, not Ate-a). It's one of 5 letters and combinations that sound roughly E-ish... Pi is pronounced Pea, the combination au (as in the letter Tau) has an F sound (so, Taff). Iota, is "Yota", so I suppose the Jupiter moon should be pronounced "Yo". Etc. "Bay-ta" for beta is not the modern Greek pronunciation, it is a good approximation to the ancient Greek pronunciation. Greek has changed a bit over the years. Also, the conventional English names for the Greek letters do not all mimic Greek pronunciations of any stage. "Pi" as "pie" for example. They are simply English interpretations of the ways the names are spelled. They are conventional. I don't think they are incorrect. I don't think it is incorrect to call Plato "play-toe" even though he never pronounced it that way himself. It is the conventional English prounciation of the name. I had to study more about this kind of thing than most people would ever want to know, but since this thread is actually about the identification of the star Atik, we might want to get back to astronomy. Edited by Michael Covington, 21 January 2019 - 10:29 PM. I'm wondering what "source" these various atlas's are using for their proper names. I've looked at their references, but they only list stellar databases for position, magnitude an other physical parameters of the stars. Does anyone know? The Yale Bright Star Catalog, maybe? There are several star catalogs that try to give information about star names. Edited by brentknight, 23 January 2019 - 11:49 PM. Maybe the inhabitants of Omicron Persei 8 are purposely causing the confusion??? We do get our names from the Yale Bright Star Catalog. Thus "Atik" is Omicron Persei in SkySafari. It would be interesting to trace who followed whom -- you could do a genealogy of star atlases and catalogs (just as people reconstruct the transmission of ancient manuscripts by figuring out which copies were made from which).